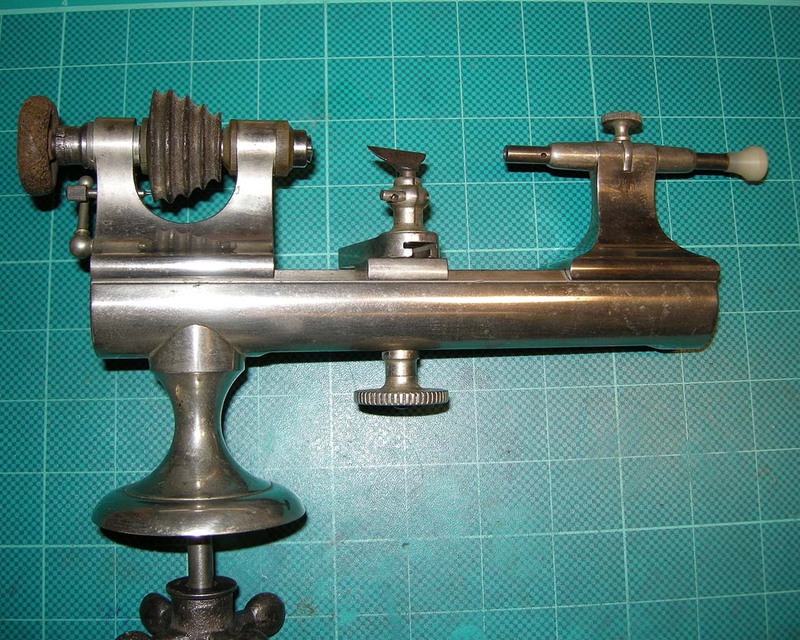 PARTS NEEDED: RARE ANTIQUE AMERICAN WATCH TOOL CO. 5.4mm WATCHMAKER'S LATHE - NASHUA No. 1 ? Unfortunately, it is not complete. I have the headstock, missing it's pulley, index pin and lock down mechanism. The headstock spindle & cone bearings look to be in great shape and turns very smoothly though it is missing the adjusting nut. The bed is just under 8 at about 7 15/16 inches long or 201mm. It is about 33mm in diameter or 1.299 inches. The foot or pedestal is only about 2 1/4 inches high. Anyone else have one of these or any of the missing parts? I think I have one of those. It is marked the same as yours and on the headstock the markings are the same. Mine is No. 3838. I have one collet and the body of it measures 4.96mm. As you can see in the picture it looks like yours. Here is a link to a picture. The squares on the green mat are 1". Posted on a separate thread.